I'm in the middle of writing up some work and I thought I'd spend a bit of time explaining how utterly ridiculous strategy is in many organisations. I know people like to talk about chess in the boardroom but most of the time it's more like equal parts of copying others, alchemy, astrology, story telling and gut feel. To illustrate this, I'm going to explain one super simple move which should never work but does - almost all the time. This move, I'll call Fool's mate. Now since this move is in play in various industries, I'm going to use a hypothetical example to demonstrate it. 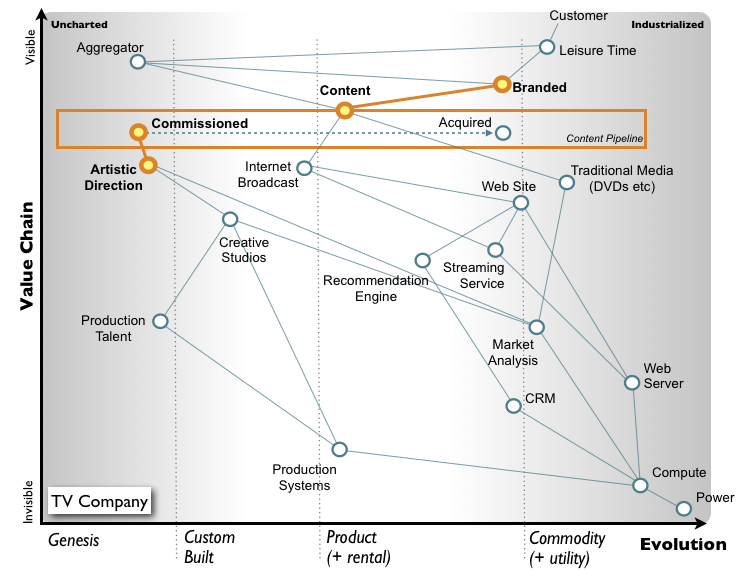 I'll start with a map of a particular media industry (see figure 1). From the map above, I've highlighted certain parts. First, the company sells its content (i.e. shows) through both aggregation sites and its own branded efforts. The shows themselves come from a pipeline with constantly evolving content - it's starts as a novel show and then becomes a sold or acquired format. The distribution mechanisms are shown but what I'll focus on is the artistic direction side which defines the type of novel shows produced. In this case, the shows are produced by creative studios, of which there are a limited number. This creates a constraint and as a result the cost of producing shows is quite high. Ideally, if you were the company commissioning and distributing shows then you'd like to see a more fluid and competitive market. However, those same creative studios will resist any drive to commoditising their field. I've marked this all up in figure 2 including a red arrow for how you'd like to change it and a black bar for the inertia the studios would have against this. The creative studios themselves have a constraint which is talent and access to production systems. This relationship is shown in figure 3. 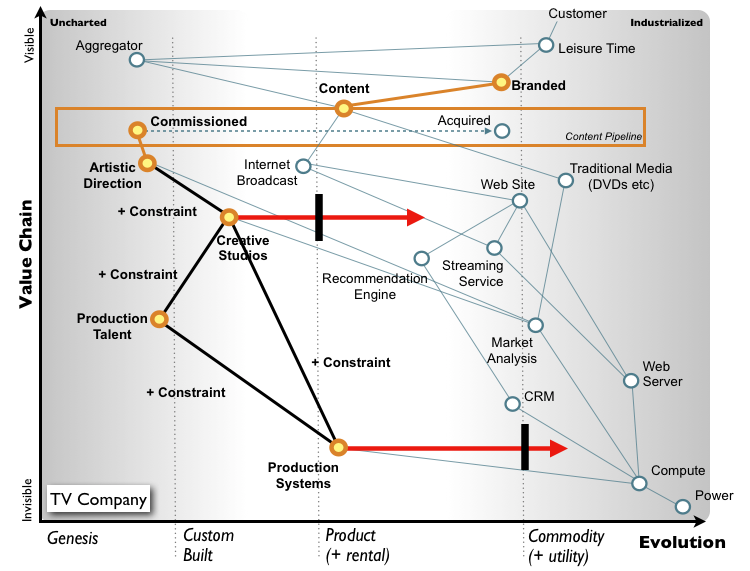 By commoditising the production systems, you should therefore be able to increase the talent pool and drive the creative studios towards more of a commodity creating a more fluid market. Now, those companies involved in providing production systems (i.e. the physical studios themselves, the equipment etc) aren't going to be happy about a commissioning company entering this field and trying to make it more of a commodity. They will have their own inertia (shown in figure 3 above) and resist. The creative studios should of course resist this change as well because the effects on their industry (e.g. reduced barriers to entry) are so obvious. However, if they were absolutely clueless then they might support it because it reduces their cost of production i.e. they're thinking in the immediate short term and not the strategic outcome. Such a deliberate move by a commissioning company - the chess equivalent of Fool's mate - should never work but it does, in industry after industry. 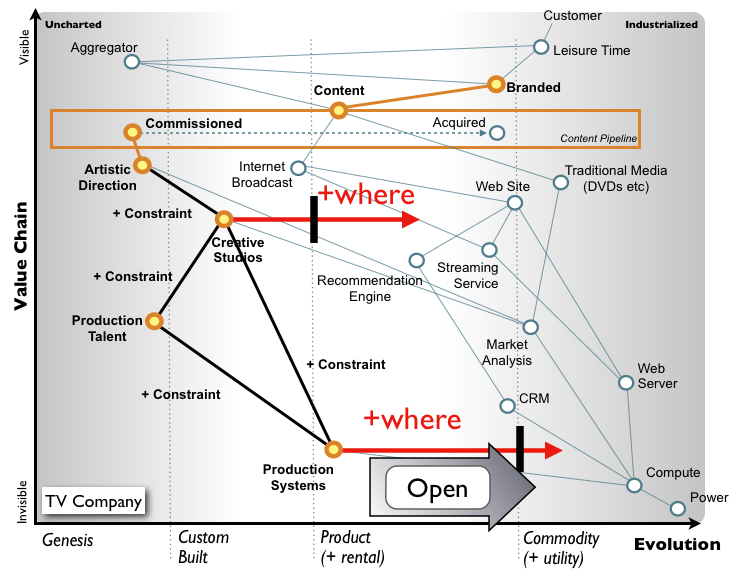 Yes, I am saying that companies often support the commoditisation of an underlying component or constraint without realising this will reduce barriers of entry into their field and ultimately commoditise them. Companies seem to act thinking of the short term with no understanding of the impacts to themselves. Most of the problem appears to be that companies cannot see the environment (i.e. they have no map) and aren't used to any actual form of strategic play. To be honest, this is like stealing candy from a baby except the candy is worth millions or billions. What is really frightening, is it takes a couple of hours to map out and work out such a play. There is no way on earth you should be able to get away with this and I'm afraid it gets worse. This particular move is one of a set of very basic approaches (see figure 4). I'm always surprised by how many companies don't even use these basics in a co-ordinated fashion. This is kindergarden stuff in the world of strategy and we're going to see a lot of big name casualties over the next decade caused by truly poor gameplay. 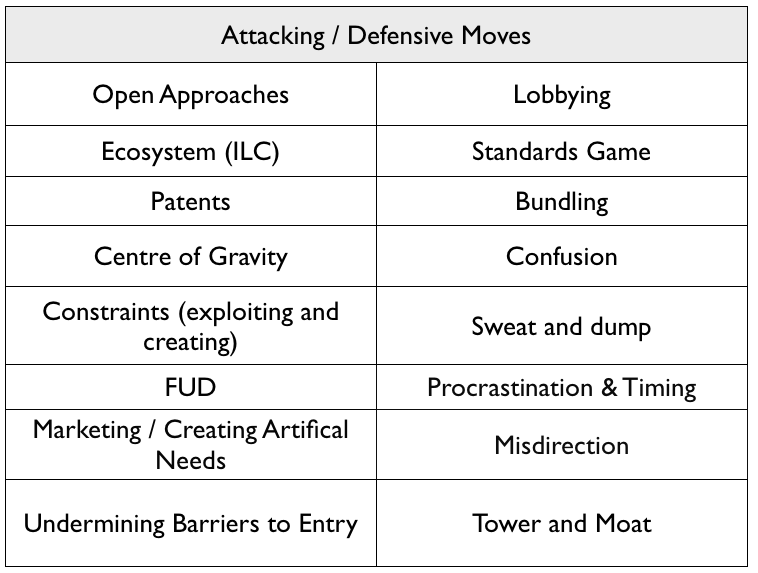 Figure 4 - The most basic attacking & defensive moves. However, the death of companies is not the point of this post. What I'd like people to realise is that many companies have little or no strategy and they're not actually used to playing the game. They instead rely on communication tools like SWOT or Business Model Canvas (which are both great communication tools) that lack any context. These companies aren't playing chess against each other, they have very little idea what the board looks like. Which, if you're a start-up is great news. Don't fear the giants, they're easier to take out than you'd expect. One thing I'd like to also reiterate is the importance of where to attack. Why is a relative statement i.e. why here over there and so any strategy should start with the where. In figure 5, I've marked on the two "wheres" that you could attack. One "where" is to attempt to commoditise the creative studio space. The problem of course is the constraints will still exist, the creative studios will resist and you'll be in direct competition with the studios which you use as suppliers etc. In all likelihood, you'll probably create a war on talent and end up increasing your cost of program production. The other "where" is to attempt to commoditise the production systems. You'll have resistance from the vendors in that space but assuming the creatives studios don't understand the game, they'll probably support you (for reasons of short term reduction in their costs). You could deploy an open approach here (e.g. open source, open hardware, open APIs) and the effect of commoditising this space is likely to reduce both the constraints caused by expensive production systems but also the talent constraint by making it easier for people to get into the field. 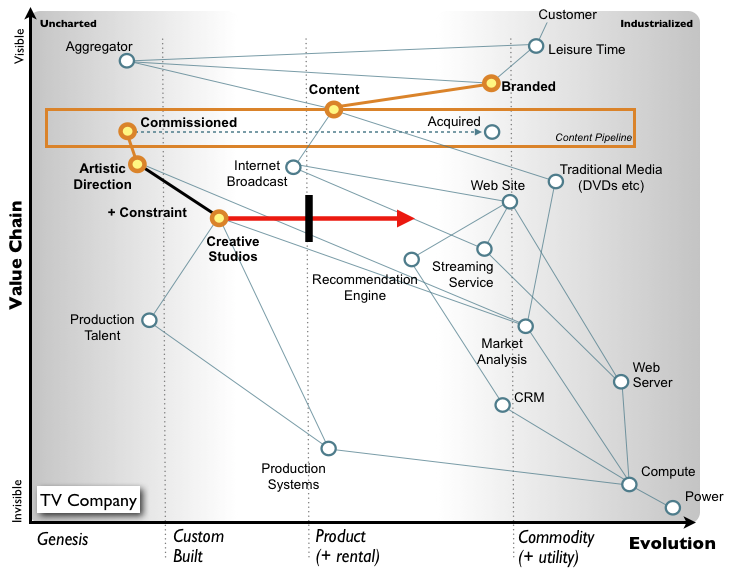 The net effect will be to commoditise the creative studio business - which is what you're after. So, you have two "wheres". The "why" you should attack one over the other should be self obvious by now. As a word of warning, if you ever employ a strategy firm then if they start talking about the importance of why, simply ask them to explain the "where" to you first. If they bluster, you know you've got a dud. Get rid of them quick - they're costing you oodles and you'll get nothing of real use. PS. Don't ask me for strategy advice / consultancy - I don't do this, I'm not a gun for hire. I research on behalf of the LEF members. My ONLY advice to you is learn how to map and play the game.